Throughout history, human beings have enjoyed the beauty and grace of butterflies as much as we celebrate the flowers whose nectar they collect and the sunny summer days in which they are most active. Butterflies, along with moths, are members of the Lepidoptera order of insects. Butterflies can be distinguished from moths in several ways. Butterflies are active only during daylight, and almost all moths are active only at night. Butterflies flutter gracefully in flight, especially when compared to the halting, clumsy flight of the moth. The truest identification of the butterfly is the bulge at the ends of the butterfly’s antennae, which is called the antennal "club." Practically none of the moth species have antennal clubs. Butterflies have a very acute sense of smell, which the adult females use to find the right plants on which to lay her eggs. Cells called "chemoreceptors" on the butterflies’ antennae and lower legs respond to smells and enable the females to locate the exact type of plant which their newly hatched worm-like larva, called caterpillars, prefer to eat. Many varieties of butterflies produce larvae that can live on only that one type of plant on which the female lays her eggs. The metamorphosis of the larva into a butterfly is one of nature’s most fascinating processes. As the larva grows, it repeatedly outgrows and splits its skin, which it molts and replaces with a larger skin. When, after several molting cycles, the larva is full grown, it spins a silk cocoon, called a chrysalis, which has a hard surface and no outward signs of life. Inside the chrysalis, the larva becomes the intermediate stage pupa which then transforms into a butterfly. Once the butterfly is formed, the chrysalis splits open and the butterfly emerges, pumping fluid into its wings to unfurl them. When the butterfly has dried in the sun and has become warm, it flies off to begin collecting nectar from its favorite flowers. Most butterflies live for only one or two weeks after their metamorphoses. Some smaller species live for just a few days. The nymphalid family of butterflies, characterized by small front legs which are useless for walking, including the Monarch and the Mourning Cloak, live up to eight or nine months. In order to avoid predators during hibernation, Monarchs migrate up to 2,000 miles south in August and September. There are two paths of Monarch migration. Monarchs west of the Rocky Mountains winter in Pacific Grove, California, on the northern side of the Monterey Peninsula. The annual appearance of the migrating Monarchs in Pacific Grove is celebrated with the Butterfly Festival, complete with the crowning of a "Butterfly Queen." East of the Rockies from as far north as Ontario, Canada, Monarchs convene in large flocks on the eastern seaboard of the United States en route by the millions over the Gulf of Mexico toward their November hibernation in a few groves of oyamel fir trees in central Mexico, approximately 2 miles south of Mexico City. In a state of suspended animation in temperatures just above freezing, the Monarchs blanket the fir trees so heavily that boughs sometimes break under the accumulated weight of the millions of butterflies! 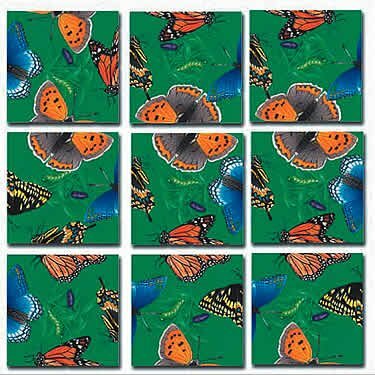 In late January, as the daylight hours begin to increase, the Monarchs gradually become active, revitalizing themselves with nectar until they again take to the skies in an orange and black blizzard of fluttering wings to begin their multi generational excursion back north. Arriving first in the southern United States, the migrating Monarchs deposit their eggs on milkweed plants in the late spring. When the eggs hatch and the Monarch caterpillars transform into a new generation of Monarch butterflies, this second generation travels northward and produces a third generation in the northern United States. This third generation of Monarchs reaches Canada by late July and produces a fourth generation, which inherits the responsibility for the species to begin again the massive southerly Monarch migration to Mexico.